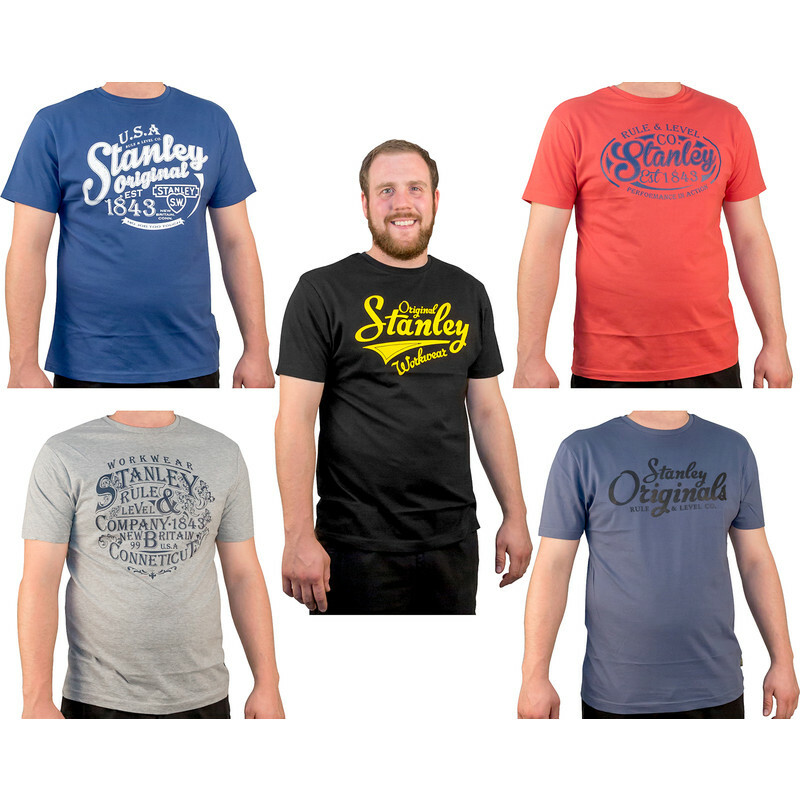 5 pack of short sleeve 100% cotton printed Stanley t-shirts, each with an individual design. Stanley Fargo T Shirt 5 Pack Large is rated 4.0 out of 5 by 15. Rated 5 out of 5 by Capn from Great value Good t-shirts, haven't shrunk and held their shape well. Brilliant price for each t-shirt when you break it down. Rated 3 out of 5 by Bobthebuilder1 from Wrong size and color Received two packages with 5 shirts each. Two variation of colors, instead of 5, not how advertised. To top it off, one of the shirts is wrong size not how marked on package.. product is good but feels like some one was tempering with the colors intentionaly to remove the best looking shirts.. Not acceptable. Rated 5 out of 5 by Musicman from Great T Shirts Good quality, size accurate at XXL and nice design. Rated 5 out of 5 by WGC123 from Perfect Fit A great selection of well-designed t-shirts, they feel strong and come up a little large (but not too long) which is perfect for me. Rated 2 out of 5 by a gardener from sizing is wrong brought large - like i always do, but they where more like a XL, should of read the other reviews that state this. was cheap though. Rated 5 out of 5 by Paul B 321 from Excellent value and quality Can't go wrong with 5 work tshirts for the price Wash well and keep their shape. Comfortable to wear and not too heavy. Nice design and fit. Wouldnt hesitate to purchase again.